My name is Blair Blanchette, and I’m a rising third year majoring in Biochemistry. In this brief blog post, I hope to give you a little insight into staying fit at UVA. In my two years as a UVA student, I can certainly say that UVA students love to exercise and stay healthy! UVA has three gyms on grounds that are free to students during the year. Those gyms have squash and racquetball courts, saunas, an Olympic-sized swimming pool, the biggest hot tub on this side of the Mississippi (which also doubles as a movie theater), and more ellipticals, rowing machines, treadmills, and free weights than you can count. In addition, the Aquatic and Fitness Center (also known as the AFC) hosts drop-in fitness sessions, such as spin classes, yoga, pilates, zumba, and kick boxing. There are more than enough locations and events for every student to stay fit. When UVA students aren’t cheering on our top-tier sports teams, we love participating ourselves, either at the club or intramural level. Because our varsity athletics are so strong, our club sports are equally competitive and popular. The sports offered range from what I would consider typical, such as soccer, tennis and lacrosse, to the atypical, such as fencing, archery and riflery and Quidditch. If you’re looking for a little less intensity, intramural sports last for about four weeks each season, so you can try a variety of sports with your friends, including inner-tube water polo and Wallyball. Since there are so many options, every student finds their own way to stay fit, whether it be through an organized sport or just running around the Rivanna trails, the city of Charlottesville, and our beautiful grounds. One thing that really didn’t hit me until I made my college decision was how important the community around the university is. When you think about it, this college, this new destination, is going to be the place where you live for four years of your undergraduate life. Hey everybody, my name is Keith Wilson, and I am a rising second year from Louisville, Kentucky. While at The University of Virginia, I will be studying Music, and am looking forward to applying to The Frank Batten School of Leadership and Public Policy. When it came time for me to decide what I wanted to tell y’all about, I knew that one of most hidden wonders about UVA is how incredible the Charlottesville community is. One of the best aspects about UVA is that everything happens so close to central grounds. Charlottesville is an unbelievable town with some really cool facets. Let’s start with what’s closest, what’s most active, and where all the students walk to for some good eats- The Corner. Now don’t be confused, The Corner isn’t just one establishment, it is a whole row of them. With so many choices, students always find new places to call their favorite. I can remember coming to UVa for the first time and having a student vehemently tell me to get the Chipotle Chicken Sub at Little John’s New York Deli. I still go back to that first meal on the corner and think if it became a big factor in making my final decision. 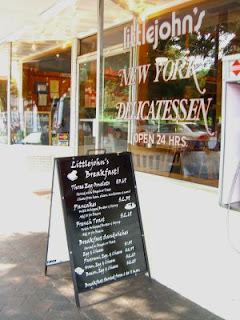 It wasn’t because the meal was so good, trust me Little John’s is the best, but it was the fact that all of the students that walked along the corner all seemed to be so full of life. Charlottesville, as a university community, is so welcoming to the students. With such open arms, students really do feel as if the corner and the near off grounds area is just like walking around grounds. Big groups will grab the window table at the Virginian, friends will meet at Para Coffee, dozens of hot pretzels will be ordered at Mellow Mushroom, hundreds will compete to get the #1 ticket at bodo’s, and thousands of Marco and Luca dumplings will be served. The corner is an incredible environment that allows students to grab Sunday brunch, a quick snack in the middle of the day, or a great place to spend a Friday night. The best thing is that it is so close to central grounds. How close? Let me put this in prospective for you. If Tiger Woods were to tee up on the lawn steps of the rotunda and hit his record long drive (425 yards), he would out shoot the corner by over 100 yards. A view of "The Corner"
But the fun doesn’t stop just 300 yards away. One of my favorite things about Charlottesville is the downtown mall. According to the city of Charlottesville website “The Historic Downtown Mall is considered one of the finest urban parks in the country. This pedestrian mall is home to a vibrant collection of more than 120 shops and 30 restaurants located in the historic buildings on and around old Main Street Charlottesville.” The downtown mall is truly like walking down a piece of history. When you look on both sides you see the façade of historic “Main Street”. When you walk into each establishment, they all have their own unique feel. The downtown mall is very particular about not allowing chain restaurants dominate the area. Supposedly a Starbucks has tried for years to land on the mall, but with no success. Some of my favorite places include Café Cubano, Chaps Ice Cream, and the famous Timberlake’s Drug Store. 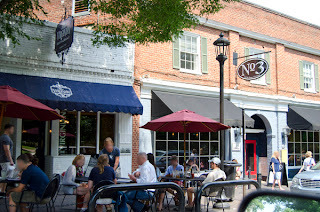 Timberlake’s is home to a completely original soda fountain and diner, a very cool spot. A walk down the downtown mall. The downtown mall, as stated above, is also home to some really cool shopping. 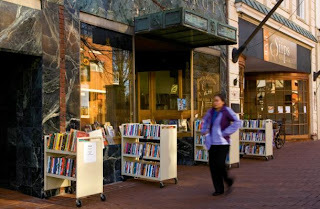 The used bookstores are elegant and affordable, the little fashion boutiques are quirky, and the antique stores are like stepping back in time. Above all, my favorite thing about the downtown mall is the opportunity to find some of the best performing arts around. The Jefferson Theatre, Paramount, and Live Arts all provide some great opportunities to see some live shows. 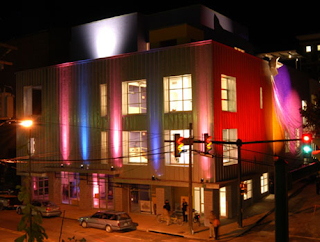 Funny enough, I find myself embarking on a run of the Broadway Musical “Hairspray” with Live Arts. We open tomorrow night! I cannot wait to hit the stage, belt out the high notes for “It Takes Two” and “Without Love”, it really will be great. 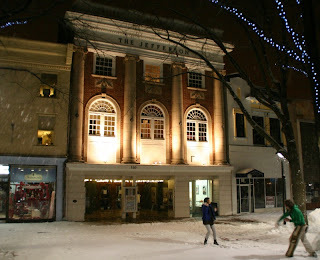 Students having a snowball fight in front of "The Jefferson Theater"
I have spent countless nights on the downtown mall going to concerts, musicals, plays, and just sitting in Mudhouse drinking coffee. It is truly an awesome place to go explore. The University of Virginia offers free trolley rides to the downtown mall for students. With an Iphone and Android app that tells you exactly when the bus is coming through GPS technology, getting to the Downtown Mall is very accessible. Many day trips can be made around the Charlottesville Area. People love picking apples on Carter Mountain, jumping into the blue water at the local quarry, hiking, biking, and sightseeing. When it comes down to it, Charlottesville is a great place to spend your four years as an undergraduate student. One of the many great questions you could ask a UVA student is “What is your favorite thing to do in CVille?” You will be amazed on how many different answers you will get. Come visit CVILLE! It’s truly a perfect college town. Spending the summer in Charlottesville while most of the students are away has shown me the quiet, slow-paced side of what is normally an extremely energetic and lively school environment.While it has been a relaxing break, I will say that one of my favorite things about this school is the number of activities and events going on all the time—whether you're looking to get involved in club sports, salsa dancing, trips abroad, greek life, or one of the many philanthropic organizations on grounds. We have over 700 C.I.O.s at UVA which stands for Contracted Independent Organizations. These groups are contracted under the Student Council—which allocates over 600,000 dollars to students activities each year—but the key word there is independent. With student self governance as a central part of the UVA experience, all of the organizations on grounds give students the power and the resources to truly take charge of their college experience, and get done whatever it is they are looking to do. If you don't find the club or activity that you're looking to join, UVA makes it extremely easy to create your own C.I.O. (and will even give you the funds you need to get started). 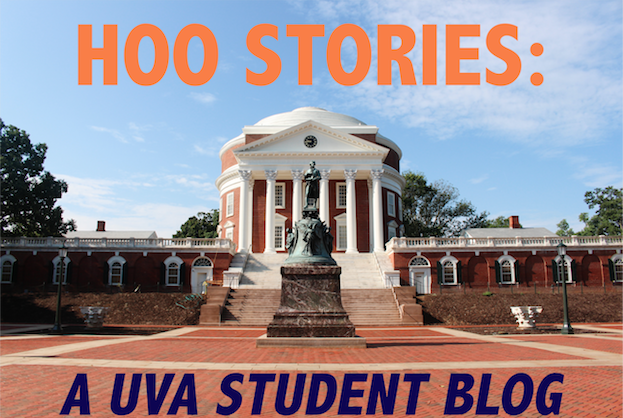 One of the stories we love to tell as tour guides is about a student who came to UVA in 2004. She responded to the essay prompt "What is your favorite word and why?" and wrote all about pancakes. In this essay she promised that if admitted to UVA, she would start an organization having something to do with pancakes. Today, that group is Pancakes for Parkinson's, one of our largest philanthropic groups on grounds. One day each fall the lawn is lined with griddles, and for a one time donation you get all you can eat pancakes for as long as you are willing to sit on the lawn and eat them. Over the past six years, Pancakes has raised over $150,000 for the Michael J. Fox Foundation for Parkinson's. As a highly selective school the University of Virginia certainly draws a student body that is extremely academically driven and serious about their studies. But there is also something about the average UVA student that leads him or her to seek a well rounded college experience—balancing academics with a number of exciting and meaningful activities outside of the classroom.